Results: In the quest to synthesize a useful material not found in nature, a scientific team developed a multidimensional analysis approach, leading to the first direct measurement of ordering in the material at the atomic scale. Through investigations of the double perovskite La2MnNiO6, or LMNO, the team, led by Pacific Northwest National Laboratory scientists, showed that combining multiscale synthesis, characterization, and modeling techniques could lead to a predictive understanding of complex materials systems. In turn, this understanding could help scientists precisely engineer these systems. The results are published in Chemistry of Materials. Lead author Dr. Steven Spurgeon, a postdoctoral associate at PNNL, his mentor, materials expert Dr. Scott Chambers; and colleagues shed light on a fundamental challenge in materials science: many proposed materials have never been synthesized because existing characterization and modeling approaches fail to capture the inherent complexity of solid state systems. Spurgeon, Chambers, and colleagues at PNNL, North Carolina State University (NCSU), Sandia National Laboratories, and instrument manufacturer Gatan Inc., put forth an approach to connect atomic-scale structure to macroscale magnetic properties. Why It Matters: LMNO has been studied by scientists for the past decade because of its value in thermoelectric and spintronic applications (see sidebar). LMNO, a ferromagnetic semiconductor material exemplifies the challenges associated with structure-property engineering of multicomponent material systems. Much debate has revolved around what chemical structure LMNO forms and how to engineer the structure to improve its magnetic properties. Existing materials characterization techniques have limitations. For example, while it is straightforward to measure overall magnetic properties, figuring out how atomic structure gives rise to those properties is much harder. Traditional analysis relies heavily on X-ray scattering, which can give detailed but indirect insight into a material's structure. The challenge is to directly image the material at the atomic scale, connect those images to larger length scales, and, finally, determine how structure controls properties. This study has met that challenge, bringing scientists closer to their goal of controllably engineering such a material. Methods: Spurgeon's background is in scanning transmission electron microscopy (STEM), one of the instruments of choice for materials scientists. TEM has been around since the 1930s, and it can provide amazing images of even single atoms. But TEM images do not always represent a material's overall structure. 3D atom map constructed using APT. Green regions are the NiO regions that form in the film, shown here in blue. The PNNL team developed a new approach to characterize material locally using STEM, along with a three-dimensional (3D) analysis technique called atom probe tomography (APT). "This combination gave us beautiful insight into how the material looks across a range of length scales," said Spurgeon. "By using STEM at the atomic scale, APT at the midrange (mesoscale), and magnetic characterization at the macroscale, we could understand how this hierarchy of structure gives rise to properties. That's huge." This approach requires advanced instrumentation unavailable at most labs, so DOE's Environmental Molecular Sciences Laboratory (EMSL) located at PNNL is key. "The suite of tools at EMSL allows us to do unique materials science. Only a handful of labs worldwide have these kinds of resources in house," said Spurgeon. The study also took advantage of the Advanced Photon Source at Argonne National Laboratory, another DOE national user facility. PNNL scientists have also used molecular beam epitaxy (MBE), for synthesizing materials a single layer of atoms at a time. With MBE, researchers can use a monitor to watch crystal layers grow, and even count single layers of material as they form. "The ability to synthesize materials this way takes years to learn, and it's as much art as science," said Spurgeon. Once the PNNL team successfully synthesized LMNO, measurements confirmed the stability of its structure. But previous theory calculations suggested that its magnetic properties were not as good as they should have been. "There should have been a much larger magnetic moment than what we observed," said Spurgeon. "So we threw every technique we could at it, including using the X-ray beam line at the Advanced Photon Source, to look at its overall magnetic properties and structure. Nothing made sense." He wondered if something was going on locally that the X-ray analysis was missing. "Our STEM analysis showed that even though we got the crystal structure we expected, the manganese (Mn) and nickel (Ni) atoms were swapping places. When Mn and Ni atoms alternate in chains through the crystal, they give rise to good magnetic properties, but if these atoms are swapped or out of place, poor magnetic properties result." 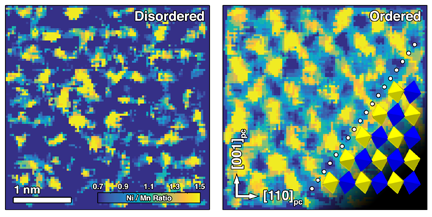 Using STEM, the PNNL and Sandia scientists found that though the LMNO crystal structure was correct, Mn and Ni atoms were randomly distributed throughout it (see left image at top), which is difficult to see using X-ray measurements because of the similarity of the two atoms. Heating the material caused the atoms to reorganize into a much more ordered structure (right image at top). "The arrangement of Mn and Ni went from a random state to a checkerboard," said Spurgeon. At the same time, they saw a huge increase in magnetic properties. By analyzing the material before and after heat treatment, they confirmed the ordering was greatly enhancing the material's magnetic properties. Enter RevSTEM. While the magnetic properties were now much improved, theory suggested that they could be even better. The scientists knew they wanted to directly image the material at larger length scales, moving from a handful of atoms to broader regions, so they used a new STEM technique called RevSTEM developed by collaborators at NCSU. Because of the way STEM images are typically acquired, they are very sensitive to small movements of the sample, making it hard to accurately measure bonds between atoms. The NCSU group developed a method that uses many fast images to correct for these distortions. Spurgeon explains, "By correcting the distortions, we can obtain more precise measurements of crystal structure and then measure the angle between atoms and compare it to what we expect. Any deviation in these angles can affect magnetic properties. That's the tie back." Using RevSTEM, the team could map the LMNO crystal structure to look for any disorder over larger areas. They found broad regions where the LMNO was slightly structurally disordered. This hint of structural disorder led the team to a shocking discovery: the supposedly pure material was actually laced with small, 2- to 5-nanometer regions of nickel oxide (NiO). 3D atom maps measured using APT showed these regions were distributed throughout the film and were so small that the X-ray analysis could easily overlook them. Because NiO is antiferromagnetic, it could greatly reduce the magnetic properties of the ferromagnetic LMNO. But why was NiO forming? The team turned to PNNL scientist Dr. Peter Sushko, who specializes in density functional theory (DFT), a popular technique for calculating crystal properties. His models showed that for the synthesis conditions used in the study, the material is at a tipping point where LMNO and NiO can form together. As Spurgeon explains, "That's the downside to MBE. We can't put much oxygen into the material. If you are using low oxygen pressure, there's a specific regime where you can get phase separation. We hadn't considered that before. But the upside is that within this growth regime, we could make a material where you might want phase separation, such as in a nanocomposite structure. To engineer these structures controllably would be of great value." What's Next? While LMNO has been studied for many years, scientists are just now beginning to understand the direct connection between structure and magnetic properties. More important, the use of advanced synthesis, characterization, and modeling approaches will allow them to gain deep insight into how materials form and what gives rise to their properties. Sponsors: This work was supported by the U.S. Department of Energy Office of Science, Office of Basic Energy Sciences Division of Materials Sciences and Engineering. Much of the work was performed in EMSL, a national science user facility sponsored by DOE's Office of Biological and Environmental Research and located at PNNL. Other work was performed at Sandia National Laboratories for DOE's National Nuclear Security Administration, at the Analytical Instrumentation Facility at North Carolina State University, and the Advanced Photon Source at Argonne National Laboratory. Research Team: Steven Spurgeon, Scott Chambers, Yingge Du, Timothy Droubay, Arun Devaraj, Pengfai Yan, Shuttha Shutthanandan, Mark Bowden, Chongmin Wang, and Peter Sushko (PNNL); Xiahan Sang and James LeBeau (NCSU); Paolo Longo (Gatan, Inc.); Paul Kotula (Sandia). Spintronics is a new type of memory electronics that couples electricity and magnetism in the solid state, in contrast to hard drives, which use moving parts to apply an external magnetic field. The hard drive is slow, energy intensive, and prone to mechanical failure. Spintronics, on the other hand, consist of a single material, similar to the kind of flash memory used in a smartphone. With such a solid-state device, you can apply an electric field to it and store information magnetically. In one sentence: A multidimensional analysis approach developed at PNNL brings synthesis of a valuable material closer. In 140 characters or less: Combining analysis techniques aids understanding and synthesis of complex materials.